APRIL 22 – 100 days. The Chief Minister’s special session “100 days and beyond” with the media saw journalists – both print and online – coming together to meet up close and personal with Datuk Amar Abang Johari Tun Openg. Also in attendance were communications specialists from government departments and statutory bodies. The grand entry of a multi-media presentation of Abang Jo’s 100-day journey as Chief Minister was impressive albeit the voice-over could have been done with a human voice capable of pronouncing the Chief Minister’s name in the way all Anak Sarawak know it should be pronounced – correctly. However, the little imperfections did not dampen the spirits of the journalists who had walked the first 100 days with Abang Jo, reporting his initiatives, achievements and plans, not forgetting, of course, the media’s desire to know how these plans could be achieved for the betterment of the state. There was some uneasiness in the air when one of the journalists asked the Chief Minister how well prepared were the civil service and the various statutory bodies and agencies to walk with him beyond the 100 days, taking cognisance of his various initiatives ranging from a digitalised economy, a Development Bank of Sarawak, light rail transit, housing, education and the continuation of Datuk Patinggi Tan Sri Adenan Satem’s legacies. But the man at the helm did not waver while fielding the hard questions but answered them with full confidence. “The whole machinery will be revamped to the level what we have in mind, involving agencies like the Sarawak Multimedia Authority (SMA), the Sarawak Digital Economic Corporation and the Sarawak Economic Development Corporation which will implement the light-rail transit – meaning we will source for experts to spearhead these major initiatives and get them off the ground,” he said. While saying he and State Secretary Tan Sri Datuk Amar Mohd Morshidi Abdul Ghani would chart the course of the state’s development up to year 2030, he also named the ministers who would be in charge of the various working committees. Minister of Industrial and Entrepreneurial Development Datuk Amar Awang Tengah Ali Hassan will head the committee for the State Civil Service as one of the three State Transformation Committees (STC). Regarding two other committees, the one for Rural Economic Development has been entrusted to Deputy Chief Minister Datuk Amar Douglas Uggah Embas while the other for Rural Transformation (infrastructure development) will be under another Deputy Chief Minster Tan Sri Datuk Amar Dr James Jemut Masing. “I hinted to him (Awang Tengah) yesterday (Friday) that he would also look after education in Sarawak because we have investments in tertiary education via University College of Technology (UCT) in Sibu, Curtin University in Miri and Swinburne University in Kuching. “In this connection, one of his (Awang Tengah’s) initial tasks will be to look into the constitution of the committee for education in Sarawak. The other ministers will look after other things,” Abang Jo said. Digressing for a moment, I would like to refer to the story told by the Gospel of Luke about two of Jesus’ disciples walking to the village of Emmaus, seven miles from Jerusalem after Easter. As they walked, they talked about things that occurred on the First Easter morning and things that sustained their faith after bearing witness to Jesus’ victory on the cross at Golgotha. Incidentally, walking is the simplest of exercises to keep healthy – you just put one foot before the other and repeat the motion. But how well we walk will depend on what we share with others in our life’s journey and who we walk with. Indeed, the Master asked the two disciples what they were discussing as they walked along, exhorting them to talk with Him and to listen to Him. We believe that as the ministers, including the newly appointed DCM, newly appointed full ministers and ministers with additional portfolios in a major cabinet reshuffle yesterday (May 6), the SS and the civil servants – each entrusted with specific responsibilities – walk with the Chief Minister beyond the 100 days, they will be talking about his initiatives, plans and aspirations and how best to bring the various projects in the pipe to fruition as economically and efficiently as possible. Working as a team with all pulling their weight will make the walk gainful and productive – one that will not only go the extra mile, but most importantly, also walk the talk. Mackenna Newman’s mom, Marci, was diagnosed with thyroid cancer last October and spent the week in isolation for her radiation treatment. 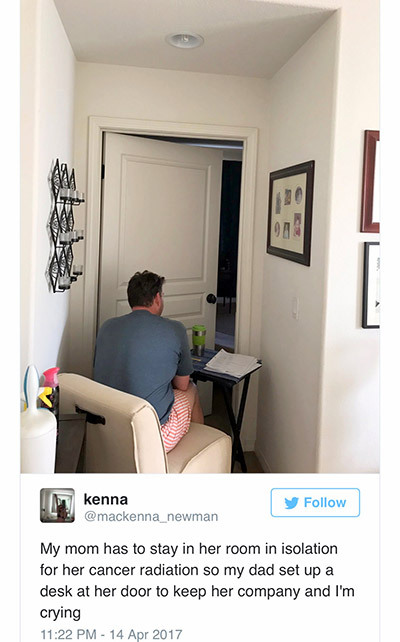 Mackenna said her dad stayed outside her mom’s room “the entire time” and Marci said this was not unusual for her husband, Jon. Yes, that’s the kind of dedication (if he can’t be my side he is as close as he can get) we need to nurture and foster to live up to Adenan’s legacies and the initiatives and aspirations of Abang Jo. Mackenna was not alone in her sadness as she received an outpouring of love and support in response to her tweet. Previous ArticleA Maphilindo pact in the offing?